Claimed by Anne-Ruth Wertheim Edie Irons Rodney Merrill Richard Hassell Daniel Ziv and 4 others. 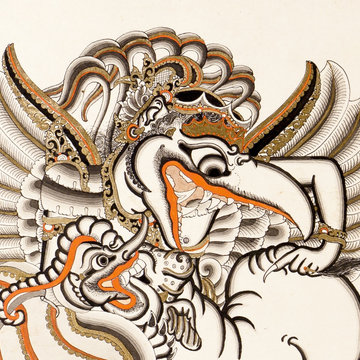 One 8.5x11 inch high-resolution reproduction of Lempad’s "Garuda" drawing suitable for framing. The central detail of the drawing appears to the left and the entire drawing may be seen at the end of the catalog description at the link below. The drawing comes with a letter from the museum’s chief curator welcoming you as a Museum Puri Lukisan friend and donor. This invitation includes a 5x7 inch (13x18 cm) reproduction of the Lempad drawing “Ni Bawang Decorated by the Birds of the Forest,” which appears on the cover of the catalog. The evening reception at the museum includes a buffet Balinese dinner. Mailed invitations will arrive after the opening, but donors at any level are welcome to attend the opening. The picture to the left shows a central detail of the drawing. The entire drawing appears on the cover of the catalog in the article below. E-Print of Lempad’s “The Dream of Dharmawangsa"
This Lempad drawing will come via email as a high resolution PDF suitable for framing. Printing may need to be done by a commercial poster-maker; general instructions come with the email. 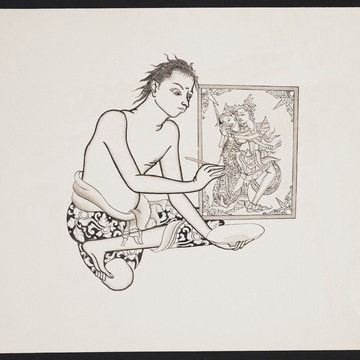 Lempad created this drawing, now in the collection of the Museum Puri Lukisan, in 1957 in ink, cinnabar, and gold leaf on paper. It measures 45 x 31 cm. but the finished print poster with border for a mat and generous margins will measure more like 55 x 43 cm. (or about 22 x 17 inches). Donors at this level will also receive the electronic invitation to the opening described in the $25 perk. bring artists to the exhibition. Contributions of $150 will cover all costs for transportation, refreshments and late-closing for one event. 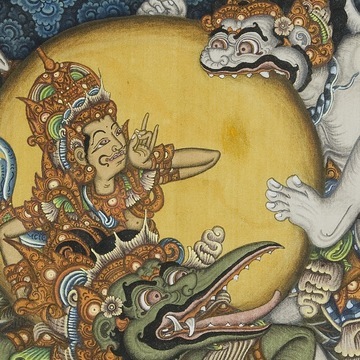 Each donation of $150 given here will enable the Musuem Puri Lukisan to give a copy of 'Lempad of Bali: The Illuminating Line' to the arts library of an Indonesian university or public museum. 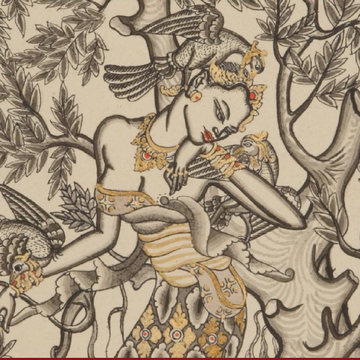 "Ketut Madra and 100 Years of Balinese Wayang Painting," the catalogue of the museum’s highly regarded exhibition of the same title in 2013, with 64 pages and 70 high-resolution color photos and plates, offers an immensely readable introduction to Balinese wayang painting and recounts the legends told in each picture. It is described in more detail at the URL below. Donors at this level will also receive a copy of the Lempad "Garuda" drawing described in the $50 perk. 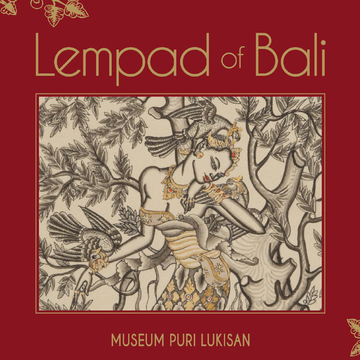 "Lempad of Bali: The Illuminating Line," the catalogue of the museum’s Lempad exhibition. At 424 pages, with more than 500 rarely seen works by the Ubud master, this book, which retails for $US200.00, is the definitive examination of his long life and work. Donors at this level will also receive Museum Puri Lukisan membership described in the $200 perk. 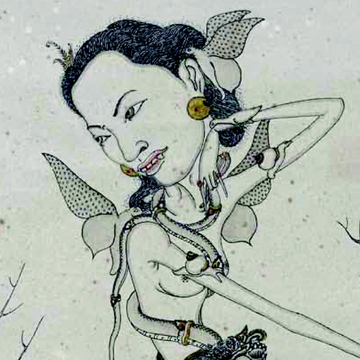 Almost all of Gusti Nyoman Lempad's early drawings left Bali in the 1930s. Three generations of Balinese have never seen them. You can help bring them home.